Certified Emotion Go ahead, put it in writing! Is there a someone special that you want to declare your love for? Something that you really like? or really hate? Here at Certified Emotion we invite you to put it in writing with an 'official' Declaration of Emotion! Now you can declare your emotions for all the world to see. You declare it and we certify it! Do you hate green eggs and ham? For just $1.37, thats right only $1.37, we will email you a Declaration of Emotion certifying it! Order now and we create a custom webpage with the declaration and then enter it into our online registry that you can share with your friends and loved ones! Looks great on your MySpace, Facebook, website or digital picture frame! 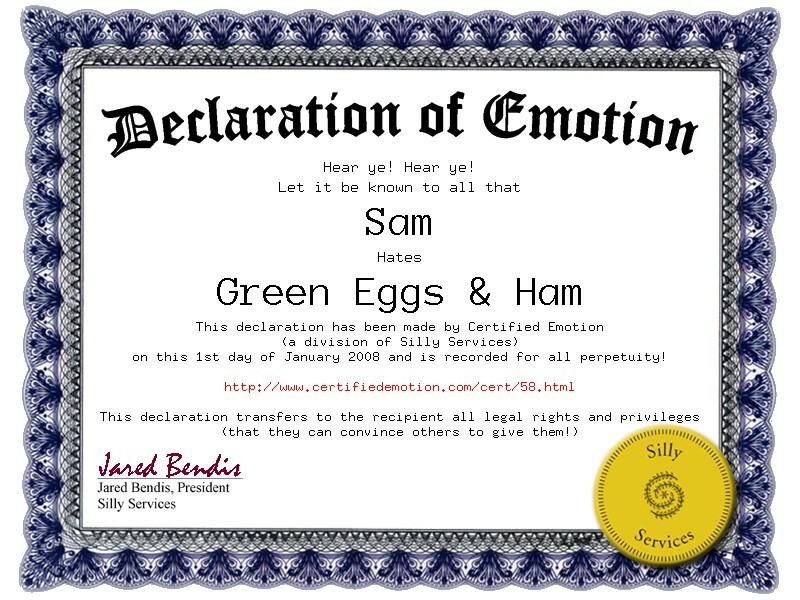 So go ahead and click Order Now: Emote and get your Declaration of Emotion today!